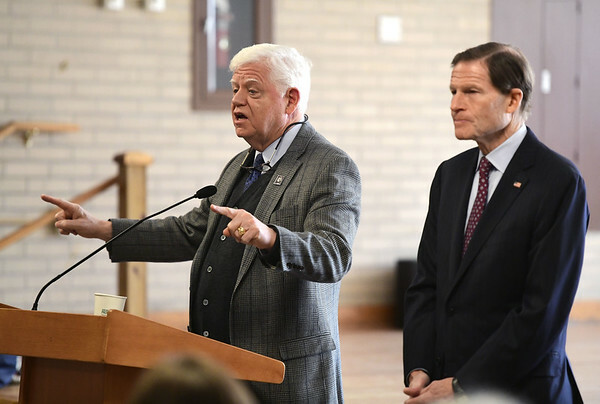 BRISTOL - U.S. Sen. Richard Blumenthal and U.S. Rep. John Larson visited the Bristol Senior Center Friday to discuss how they want to keep Social Security going at least to 2100. The Social Security 2100 Act was introduced by Larson in the U.S. House of Representatives and Blumenthal in the U.S. Senate on Jan. 30, on what Larson said would have been the 137th birthday of President Franklin Delano Roosevelt, who signed the original Social Security Act in 1935. Both Blumenthal and Larson are Democrats. The act is intended to keep Social Security financially solvent beyond the 75 years required by law, and to do it in a way “to let millennials and future generations know that it’s going to be there for you,” Larson said. For five million Americans their Social Security payment is so small they retire into poverty, and three million of them are women who stayed home to raise children instead of working outside the home, he continued. “We can pass out tax cuts to millionaires and billionaires but we can’t take care of the very people that sustained us at our most important time,” Larson said. The act proposes a two percent increase across the board to catch up with the cost of living increases that should have happened over the years, Larson said. It also includes a tax cut for 12 million seniors who work out of necessity or to remain productive. The act also increases the contribution by one percent, phased in over 25 years, and raises the cap on payroll taxes from wages over $128,400 to over $400,000. “People like Warren Buffett and others are saying you should have done this a long time ago,” Larson said. 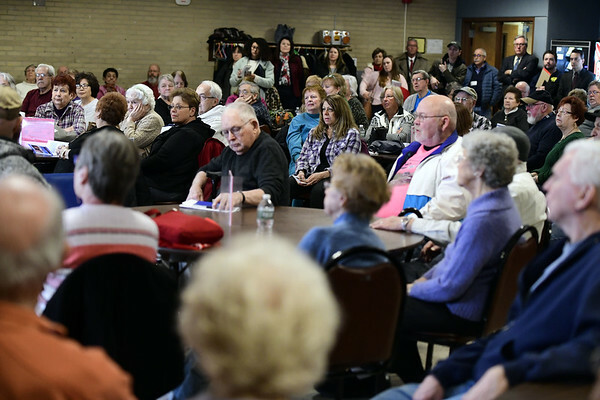 Likewise, if Social Security benefits fail to keep pace with the cost of living that’s the same as cutting it, especially since seniors are living longer and have to pay for expenses like prescription drugs, he said. Blumenthal acknowledged that getting the act passed will be more of a fight in the Republican controlled Senate than in the Democratic-controlled House. “Seniors vote, and I’m not asking you to vote Republican, Democrat, Independent. I’m asking you to vote for the candidate that supports this Social Security plan. I’d rather get Republicans coming with me because we need them, there shouldn’t be anything partisan,” he said. Larson said the House will hold its first public hearing on the bill on Feb. 6. He gave credit to President Donald Trump for recently saying Social Security is an earned benefit that people have paid for. Posted in The Bristol Press, Bristol, on Monday, 4 February 2019 21:00. Updated: Monday, 4 February 2019 21:02.